The most wonderful time of the year is almost here!!! And there's nothing like some gingerbread cookies to get into the spirit. The smell they leave in the house is amazing!!! I can't have a Christmas without having gingerbread cookies. And this recipe is moist but resistant enough to make beautiful cutouts or even 3D creations. Also, if you don't want to use shortening (the shortening prevents the cookie from spreading too much when baking) you can substitute it with an equal amount of unsalted butter. The key is in the resting of the dough. You need to let it set in the fridge for at least 3 hours before roll it. This way the dough is firm enough to roll and won't spread as much when baking. We all want those beautiful shapes to remain intact right? For regular cookies, I advise you to roll the dough no more than 1/4 inch thick. But don't make them too thin, or they'll be dry. You want a crunching bite but softer inside. I prefer to use parchment paper. This way I can roll and cut the dough directly on the paper and don't mess too much with the shape of the cookies. This cookie dough can be kept in the fridge for about 4 days and frozen for up a month (tightly wrapped in cling film and foil). I always bake them all!!! Can't ever be too many cookies, you know what I mean?? The baking time depends on how thick your cookie is and the size of it. I always start with 8 minutes and check them from that point. Once the cookies are lightly browned on the edges and firm to touch, they're good to go. I always leave my cookies to set on the baking sheet 2 or 3 minutes before transferring them to a cooling rack. This way, they set a little bit and won't be so fragile when I move them. I normally bake the cookies the day before I decorate them. This way I guarantee they're completely cooled before adding the decorations. Here you have the video to make it easier to follow the recipe and below you can print the recipe to keep. I can't wait to see your gingerbread cookies! Make sure you share them with me!!! 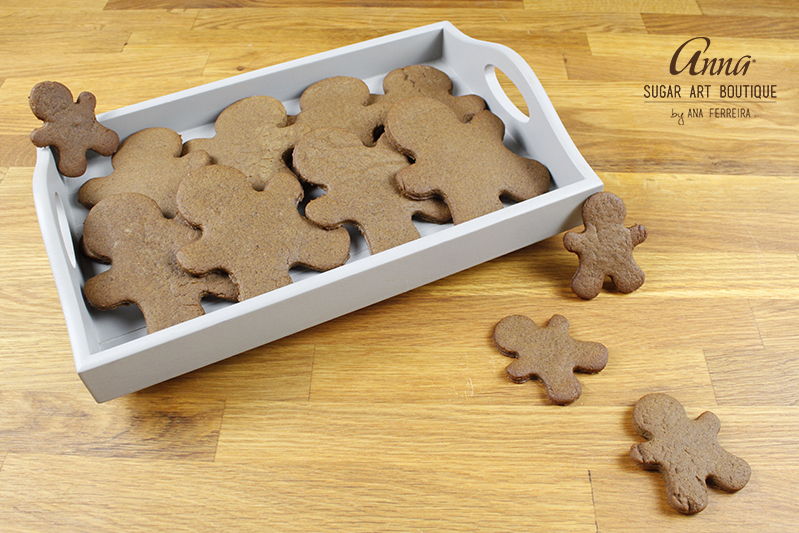 Delicious gingerbread cookie recipe with enough consistency to cutout and to make 3D creations. This recipe uses Lyle's black treacle but see notes for a less bitter taste. Sift the flour and combine it together with the ground ginger, ground cloves, ground cinnamon, cayenne pepper, bicarbonate of soda and salt. Set aside. Beat on medium speed the vegetable fat with the sugar until well combined. Lightly beat the egg just to break it, and add it. Beat all together until all is combined and light and fluffy. Scrape the sides of the bowl as you go, to make sure everything is mixing evenly. Add the black treacle** and the vinegar. Mix well. Scrape the sides of the bowl as you go, to make sure everything is mixing evenly. On low speed, gradually add the flour mixture. Don't overmix! Mix all together just until everything is well combined and you can't see any flour. Put all together and flatten into discs. Wrap tightly with cling film and set in the fridge until firm (minimum of 3 hours). Once the dough is firm and is not sticking, preheat your oven to 190ºC / 375 F. You can use a lined cookie sheet with parchment paper or a silicone mat. If you're using parchment paper, lightly dust the paper with flour. Roll your dough into the desired thickness (depends on your project) on top of the parchment paper. Don't do more than 1/4 inch thickness cookies, because you'll get the risk of getting them too dry on the edges and they can have a bulky center. Cut your cookies with the cutters of your choice directly on top of the parchment paper. This way, you only need to transfer the paper to the baking sheet and you won't lose the shape of your cookie by moving it. Place your cooking sheet on the middle shelf of your oven. Now, the time they take to bake depends on the size and thickness of your cookies. I always start with 8 minutes and check them. When the cookies are firm in the center and lightly browned on the edges, they are done. Let them rest for no more than 5 minutes on the cookie sheet and then transfer them to a cooling rack. Cool completely before decorate or store them. This cookie dough can be kept in the fridge for about 4 days and frozen for up a month (tightly wrapped in cling film and foil). These cookies should be stored in an airtight container at room temperature. They're good to eat within 2 weeks. * Lyle's black treacle gives a little bit of a bitter taste to the cookies. I like this way, but if you prefer to have a sweeter taste, you can substitute it with an equal amount of molasses or with 3/4 black treacle + 1/4 golden syrup (this also can be turned into equal parts of black treacle and golden syrup but keep in mind that the cookie will be softer). ** To easily release the molasses from a bowl, brush a little of olive oil or cooking spray before weighing the black treacle.